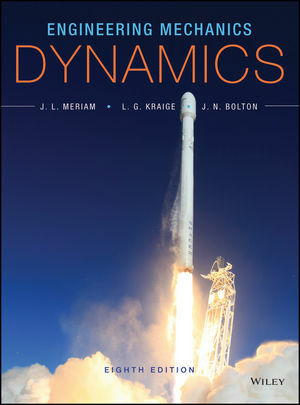 Known for its accuracy, clarity, and dependability, Meriam, Kraige, and Bolton’s Engineering Mechanics: Dynamics 8th Edition has provided a solid foundation of mechanics principles for more than 60 years. Now in its eighth edition, the text continues to help students develop their problem-solving skills with an extensive variety of engaging problems related to engineering design. In addition to new homework problems, the text includes a number of helpful sample problems. To help students build necessary visualization and problem-solving skills, the text strongly emphasizes drawing free-body diagrams- one of the most important skills needed to solve mechanics problems. Dr. James L. Meriam has contributed to the field of engineering mechanics as one of the premier engineering educators during the second half of the twentieth century. Dr. Meriam earned his B.E., M. Eng., and Ph.D. degrees from Yale University. He had early industrial experience with Pratt and Whitney Aircraft and the General Electric Company. During the Second World War, he served in the U.S. Coast Guard. He was a member of the faculty of the University of California-Berkeley, Dean of Engineering at Duke University, a faculty member at the California Polytechnic State University, and visiting professor at the University of California-Santa Barbara. He retired in 1990. Professor Meriam always placed great emphasis on teaching, and this trait was recognized by his students wherever he taught. At Berkeley in 1963, he was the first recipient of the Outstanding Faculty Award of Tau Beta Pi, given primarily for excellence in teaching. In 1978, he received the Distinguished Educator Award for Outstanding Service to Engineering Mechanics Education from the American Society for Engineering Education, and in 1992 was the Society's recipient of the Benjamin Garver Lamme Award, which is ASEE's highest annual national award. Dr. L. G. Kraige, coauthor of the Engineering Mechanics series since the early 1980s, has also made significant contributions to mechanics education. Dr. Kraige earned his B.S., M.S., and Ph.D. degrees at the University of Virginia, principally in aerospace engineering, and he currently serves as Professor of Engineering Science and Mechanics at Virginia Polytechnic Institute and State University. In addition to his widely recognized research and publications in the field of spacecraft dynamics. Professor Kraige has devoted his attention to the teaching of mechanics at both introductory and advanced levels. His outstanding teaching has been widely recognized and has earned him teaching awards at the departmental, college, university, state, regional, and national levels. Approximately 50 percent of the homework problems are new to this eighth edition. All new problems have been independently solved in order to ensure a high degree of accuracy. Sample Problems have been integrated throughout, including problems with computer-oriented solutions. Answers to all problems listed in a special section at the very end of the book. Introductory Problems are simple problems designed to help students gain confidence with a new topic. These appear in the problem sets following the Sample Problems. Representative Problems are more challenging than Introductory Problems but are of average difficulty and length. These appear in the problem sets following the Sample Problems. Computer-Oriented Problems are marked with an icon and appear in the end-of-chapter Review Problems. Review Problems appear at the end of chapter. Offers comprehensive coverage of how to draw free body diagrams. Through text discussion and assignable homework problems, students will learn that drawing free body diagrams is one of the most important skills needed to learn how to solve mechanics problems. Statics teaches students the appropriate techniques and then applies them consistently in solutions of mechanics problems. Rich pedagogical features support ease of use. Key Concepts are highlighted within the theory presentations and chapter reviews offer itemized summaries of the material covered.